Tasigur lifted a banana from the bowl at his side and turned it over in his hands. A large brown spot marred the yellow skin. Wrinkling his nose in disgust, he prodded it with his thumb, feeling the squish of the fruit inside and the gentle tear of the softened skin. He glanced around, threw the spoiled fruit at the nearest human servant he could see, and picked a bright green grape from the bowl instead. The herald was still talking, yammering on about the heroic deeds of the warrior who stood proudly behind him. 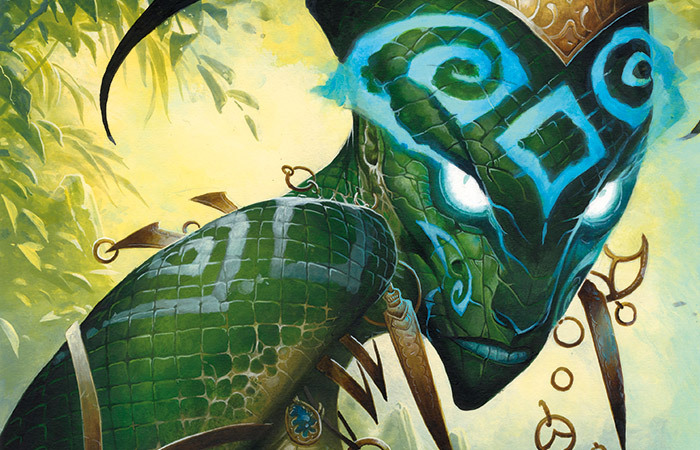 Yala was the so-called hero's name, a woman from a backwater region practically in Abzan lands. With her stocky frame, she might as well have been an Abzan—probably had been, before the last Sultai conquest. Tasigur's lip curled at the thought. "And as the dragon became tangled in the zombies' nets," the herald was saying, "Yala loosed her crossbow and buried her poisoned bolt between the beast's scales!" The herald shifted on his feet, and the hero's husband, standing just behind her on her right, almost let himself scowl. Yala didn't move, her face an impassive mask. Tasigur smiled and the herald stammered on, rushing to finish before he completely lost the khan's attention. "Wi—uh, with poison coursing through its veins, the dragon landed hard, its legs buckling under its weight, crushing zombies under its slimy belly. Yala rushed to its side as it let out its caustic breath in billowing, black clouds. Without hesitation, she plunged her spear into its chest. It writhed and shuddered, knocking her off her feet and spraying her with its acid blood, but her blow was enough. 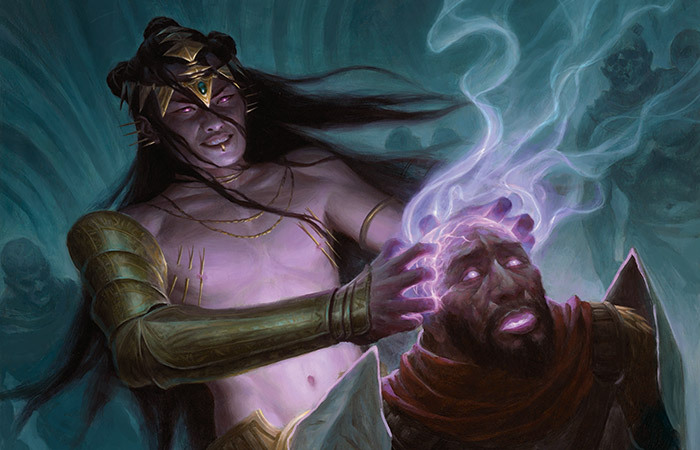 The beast died and the Sultai won the day!" It took a moment for Tasigur to realize that the herald had finished his story. He forced his eyes back into focus and popped another grape into his mouth. Then he beckoned the hero of the Sultai forward. "Yala," he purred. He saw her suppress a shudder and his mouth quirked into a grin. "Your heroic deeds are a credit to the Sultai. Please accept my gratitude." Yala dropped to one knee and bowed her head. "I am honored, my khan." "Yes, you are," Tasigur said. Turning his attention back to the fruit, he gestured for the herald to have her shown out. He yanked at the chain that bound the zombie—whose skull was part of the fruit bowl—to his throne, bringing it closer so he could more easily reach what looked like a very succulent pear. Its sweet juice dribbled down his chin as the hero of the Sultai was escorted from the chamber. Tasigur's stomach rumbled as a zombie approached his throne the next morning, carrying a tray laden with food. The zombie stopped a few strides away and waited as a living servant was brought out to sample the food. 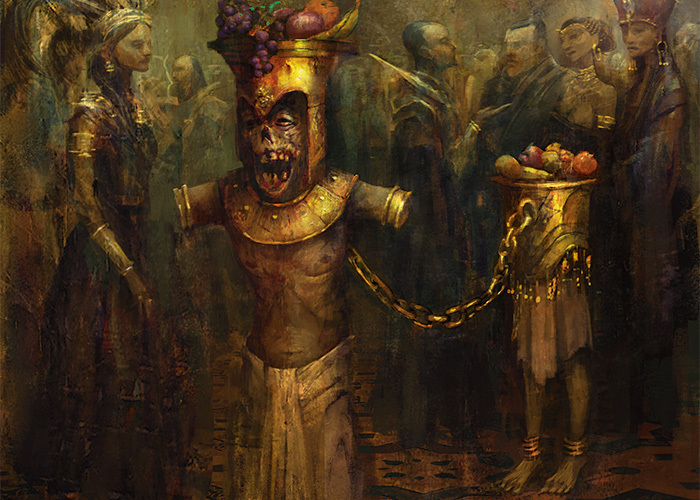 Tasigur shifted in his seat, impatient and hungry, angry that a mere servant—an Abzan wretch captured in a recent raid—should be allowed to taste his food before he could eat. It smelled exquisite. The servant seemed delighted, savoring each bite with his eyes closed and a broad smile on his face. No doubt this was better fare than he'd ever had in his life. For a moment Tasigur congratulated himself—he was a kind and beneficent lord who allowed the fine pleasures of life to those who served him, even if their service was unwilling. Then all the pleasure vanished from the servant's face and his eyes went wide. His hand clutched at his throat, and Tasigur leaned forward in his throne. "What's happening?" the khan demanded. Flecks of black foam appeared at the corners of the servant's mouth, and he fell to his knees, gasping for breath. "Poison!" Tasigur shouted, springing to his feet. The servant collapsed, writhing and shaking, and finally screamed—a long, shrill note that ended in a sick gurgle. Tasigur scanned the faces of every servant and courtier around him, looking for some hint of treachery, some indication of who was responsible for this attempt on his life. Blank faces—tanned human faces pale with shock, the inscrutable scaled faces of the naga, the vacant eyes of the zombies—stared back at him, waiting for his command. "Khudal," he said. He fell back into his throne. "Bring me Khudal." Only silence greeted his command. "I need Khudal!" he shouted. A voice hissed in the shadows behind the throne. "My khan, one does not summon Khudal." Shidiqi, his closest advisor, slithered to his side. "Am I not the Golden Fang?" "Of course, my khan," the naga said. "Yes, yes," Tasigur huffed. "Take me to him now!" Shidiqi gestured to the shadows and six zombies came forward. Each group of three was linked by golden chains that passed through their chests, where their hearts should have been. The zombies took up positions alongside the throne and, on Shidiqi's command, stooped to lift it from the ground. The throne swayed, provoking an angry curse from Tasigur, but then steadied as the zombies followed the naga out of the audience chamber. As they moved through dim corridors barely wide enough for the throne to pass, Tasigur fumed. Someone had tried to kill him—someone dared. As if his tasters wouldn't foil the attempt. As if he couldn't identify the traitor. Someone was about to pay dearly for this idiotic treachery. Darkness closed around Tasigur as the naga led him into the rakshasa's chamber. He heard the soft hiss of Shidiqi's invocation beckoning Khudal from whatever nether regions he occupied, and a chill washed down Tasigur's spine. The rakshasa stepped into the dim half-circle of light spilling into the room from the hallway outside. "My lord." His voice was a rumbling growl befitting his feline head. "Someone tried to kill me," Tasigur blurted. "Yes," the demon said. "I have seen it." "You saw? Then you know who put the poison in my food? I demand that you tell me this instant!" "You demand it?" The rakshasa sounded amused, and Tasigur's fury boiled. "Yes!" he shouted. "I am the Golden Fang, khan of the Sultai, and my demands must be answered!" "Indeed," the rakshasa said, nodding the slightest of bows, showing more mockery than deference. Tasigur's face flushed. "Tell me who is responsible." "I possess the knowledge you seek," Khudal said. "I ask only the smallest favor in exchange for my service to my khan." "Your duty is to serve your khan—you are bound to give me this information." Tasigur thought he saw the rakshasa and Shidiqi exchange a glance, and he softened his tone. "However, I am a kind and beneficent lord, and I show favor to those who please me." Even if their service is unwilling, he thought. "What favor would you ask?" 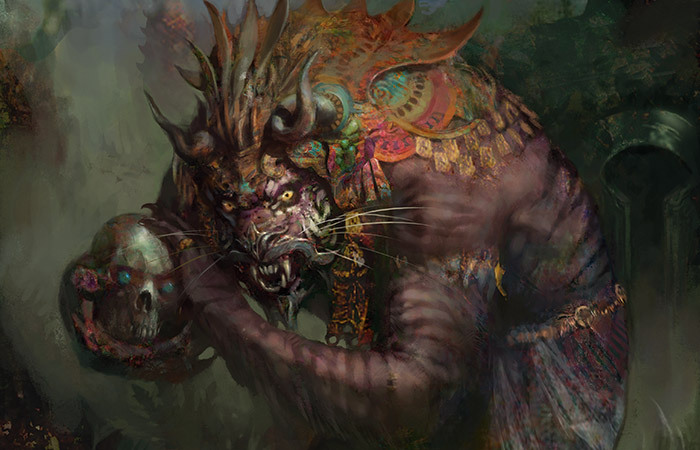 The rakshasa's feline mouth twitched with what might have been a hint of a smirk. "After I name the traitor, my khan, I ask that you carry out whatever punishment you see fit—short of claiming the traitor's life. I would take that life myself, in order to feed on the traitor's soul." Tasigur shrugged. "A small enough favor. Name the traitor." "Yala, whom you honored before your throne yesterday, has done this." Anger seized the khan, leaving him speechless and trembling. That this so-called hero should betray him after receiving his commendation, that his herald should bring someone so vile into his presence—it was too much to be borne. He waved his hands to the naga, who led the zombies in slowly turning the throne around. Khudal disappeared back into the shadows. By the time the shuffling procession made it back to his audience chamber, Tasigur had found his voice. "Bring Yala," he snapped. "And her husband. And that blathering herald." Tasigur shifted in his throne, carefully crafting the appearance of perfect unconcern. He pulled at a strand of his razor-tipped whip, bringing it in line with the other coils in his right hand. Then he draped his left arm over the arm of the throne just so. Satisfied, he turned his head—careful not to move anything else—to address the nearest human servant. "How long has the traitor been waiting?" "Perfect. And her husband—is he prepared?" Shidiqi slid closer to the back of his throne and hissed. "Yes, Khan." The large doors at the far end of the audience chamber ground open and a new herald led Yala back into his presence. Tasigur smiled, seeing fear and anger warring on her face despite her best efforts to keep calm. It was all he could do to sit still as she walked to the same position she had occupied the day before and the herald withdrew. "Welcome once again, hero of the Sultai!" he said warmly. She bowed deeply. "Thank you, my khan." "I owe you an apology," Tasigur said. "In my impatience yesterday, eager for the tedious ceremony to come to an end, I neglected to give you a gift in recognition of your heroism." "Your praise is gift enough." "Oh, no. Let it never be said that the khan of the Sultai withholds what is due to his faithful servants!" He waved absently, beckoning a zombie forward. The fresh corpse shuffled out from the shadows, carrying a velvet pillow. Tasigur watched Yala's face, savoring the anticipation. The blood drained from her face as she recognized the zombie and fell to her knees. Staring aghast at the animated corpse of her husband, she mouthed his name, but no sound emerged. "No, the hero of the Sultai need not kneel before me!" Tasigur said, beckoning two burly servants forward. They flanked Yala and lifted her roughly to her feet, bringing her face to face with her husband and his lifeless eyes. She turned her head away. The zombie tried to shift its pillow into one hand, but dropped it. A necklace clattered on the stone floor. "Clumsy oaf!" Tasigur snapped. "Pick it up!" The zombie shuffled a few steps and lifted the necklace, then turned back to Yala. With a lurch, it put the necklace over her head, brushing her cheek with one cold hand. She winced and tried to pull away, but the servants held her fast. "Please accept this token of my gratitude for your heroic deeds," Tasigur drawled. Yala looked past her husband's lifeless eyes to glare at the khan. Sneering back at her, he snapped his fingers. Yala's eyes and mouth went wide as the necklace tightened around her neck. She pulled free of the servants' grasp and clutched at the garrote, trying in vain to get her fingers under it. Tasigur stood. "That is how you see yourself, is it not? A hero, a champion of the people, sneaking into your khan's palace in the dark of night to poison my food?" He stepped down onto the back of the zombie that served as his footstool, prostrated on the floor before his throne. "Did you think to claim my throne for yourself?" he said. "Yala Dragonslayer, khan of the Sultai?" She fell to her knees, and Tasigur snapped his fingers again. The necklace loosened, and Yala drew a long, gasping breath as she bent her purpling face to the floor. "Bind her hands and show me her back," Tasigur whispered, and the servants flanking her roughly obeyed. He let the coils of his whip fall from his hand, the silver razors on its many ends clattering on the stone. "No, my khan," Yala said, still panting. "I am loyal to the Golden Fang!" His whip cracked and Yala screamed as the razors tore through silk and skin to draw their crimson lines across her back. He dangled the silver claws over the wounds, savoring her pain. Khudal wanted her alive, he reminded himself, so he could not enjoy too many lashes. With the fourth lash, she could no longer scream. Sighing, he carefully coiled the whip again and laid it on his throne. The servants hauled her to her feet and held her up within the khan's reach. Tasigur closed his eyes in a moment of concentration, and his hands began to glow with a purplish light. Grinning, he sunk his fingers into Yala's head and sifted through her thoughts. So much delightful pain and horror, so much fear, so much burning hatred. He prodded at the hate he found, looking for her memories of her treachery. His smile faded. Yala remembered spending the evening celebrating with friends, falling asleep in her husband's arms, and greeting the morning with a smile born of well-earned pride. Nowhere could he find evidence that she had poisoned his food. Snarling his frustration and disgust, he wrenched his fingers and snuffed out what little remained of her life. Every light in the chamber went out at once, draping the chamber in utter darkness. Chaos erupted everywhere as servants tried to find the torches and light them again. And Tasigur heard a whisper in his ear. "You swore that I could feast on her soul," Khudal said. Tasigur clenched his fists. "You lied to me," he muttered. "You have robbed me of what was rightfully mine." A torch sputtered to life, and Tasigur turned to face the rakshasa. "You lied! Yala was not the poisoner!" "No," Khudal said. "The poison was mine." "Yours? You sought to kill me?" "If I wanted you dead, young princeling, you would be dead." "I wanted Yala dead, and now she is dead." "You lied to me!" Tasigur said again, his voice growing louder as more torches drove the darkness away. "All for the sake of killing that woman?" "You're a petulant child, Tasigur," the rakshasa said. "Look at you, throwing a tantrum, quivering with impotent rage. And why? You got what you wanted—a victim to beat and kill. But I wanted her soul, and you have denied me that prize. That was a mistake you will long regret." "No, you are the one who has made a mistake," Tasigur said. He raised his voice to make sure everyone in the room could hear. "With your lies and your poison you have shown your disloyalty. Seize the traitor!" No one moved. The rakshasa snarled. "You are a fool as well as a child. 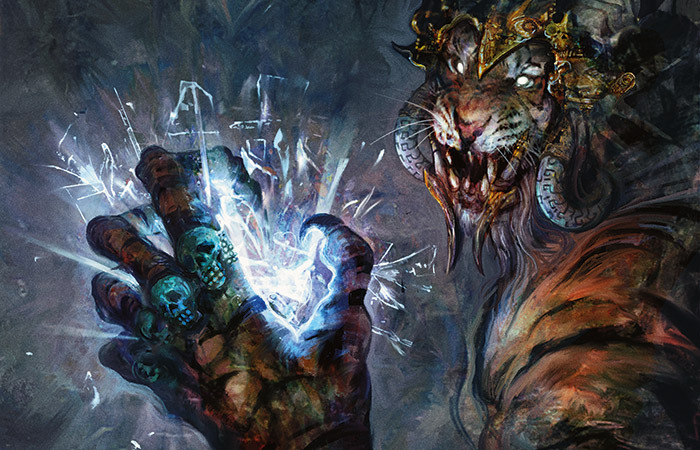 Humans rule the Sultai only because the rakshasa and the naga allow it to be so. And your insolence will end that indulgence." The razor-tipped whip lashed out from Tasigur's hand and cracked in the air where the rakshasa had been standing. Khudal's voice seemed to come from the shadows, pooling in every corner of the room: "And so the Sultai fall." Tasigur felt him go—the room seemed a little lighter, the air not quite so oppressive. He gathered the coils of his whip and sat on his throne. "Shidiqi!" he called. The naga hissed in the darkness behind him, and his neck suddenly prickled with fear. Was he surrounded by treachery? "Shidiqi, come and bow before me!" "And so the Sultai fall," the naga echoed, and she was gone, too. Shifting uncomfortably on his throne, Tasigur reached absently for a piece of fruit, but no bowl-skulled zombie stood ready at his left hand. All the zombies were gone. Without the naga and their necromancy, no one could keep them under control. Some of them had simply shuffled away. Some had gone berserk, clawing and biting at any living person in reach until soldiers put them down. And some had tugged at their chains until their rotting bodies crumbled and sloughed away to nothing. He cleared his throat, the sound echoing much more loudly than he'd intended in the mostly empty hall. 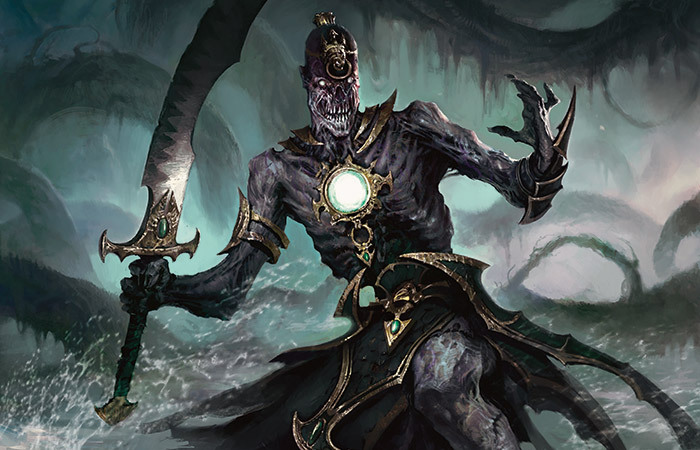 Half his palace soldiers were gone, either killed in the recent Abzan raids—intolerable, that they should have reached so far into Sultai lands!—or deserted, no longer afraid of his wrath. And so the Sultai fall. The words had echoed in his mind since Khudal and the naga left. The months since had been one long slide into a perfect fulfillment of those prophetic words. 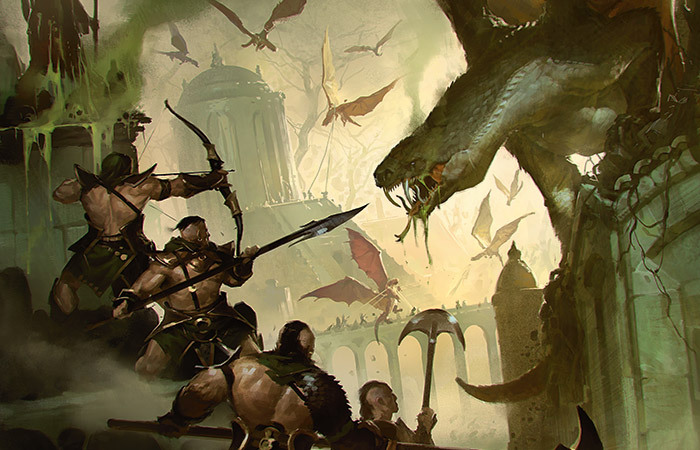 The Abzan and the Jeskai launched frequent raids, stealing Sultai goods and capturing Sultai people—or liberating members of their own clans who the Sultai had captured before, when they were strong. The people were hungry—I am hungry! Tasigur thought—and with every new assault more soldiers deserted, more Sultai citizens welcomed the arrival of enemy forces. As Tasigur's gurgling stomach announced its displeasure in the echoing hall, a young servant came to his side bearing a tray of food. Tasigur lifted a plate and brought it close to his face, peering at the scant morsels for anything that looked amiss. The naga schemed against him, he was sure, and he had no doubt that they would find a way to slip their venom into his food before long. He couldn't spare servants to taste his food for him anymore, so he speared a piece of unidentifiable meat on his knife and sniffed at it, then touched it gingerly with the tip of his tongue. It didn't smell or taste good, but it didn't seem toxic, and his stomach rumbled again in anticipation. Sighing, he put it in his mouth. Better to die of poison than starvation, he thought. No sooner had he swallowed that first bite than a herald—another new one—came bursting into the hall. "Dragon!" he cried, and a wave of terror washed through the room. "Here?" Tasigur asked, standing on his wooden footstool. As if in answer, a chorus of shouts erupted outside—cries of warning, the screams of the dying, incoherent sounds of terror—followed in a moment by the wafting smell of something acrid and vile. "Close the doors!" Tasigur shouted. "Take me to the inner chambers!" Servants rushed to obey his commands as a handful of soldiers took up positions near the great doors, ready to defend their khan if the dragon came too close. 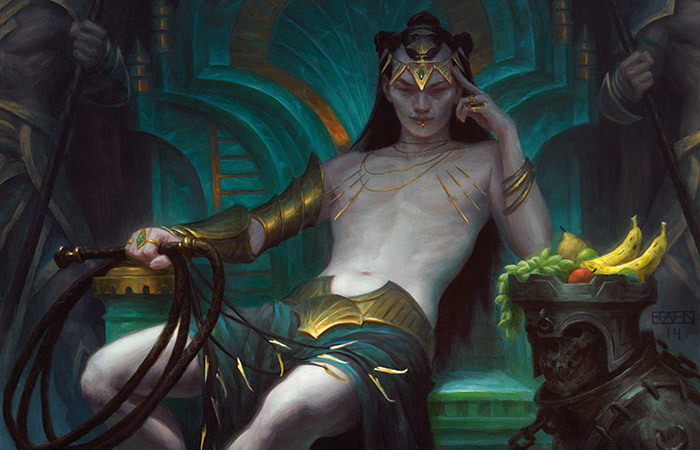 Six shuffling servants—strong enough to lift his throne but unable to fight by virtue of other injuries—carried him out through the back, into his private chambers deep inside the great palace of the Sultai. And there the khan cowered in fear until the noise died down. Tasigur stood on the banks of the Marang river. His feet had never touched earth before that day, and they were sinking into cold mud that oozed between his toes. A mass of troops formed a semicircle around him. 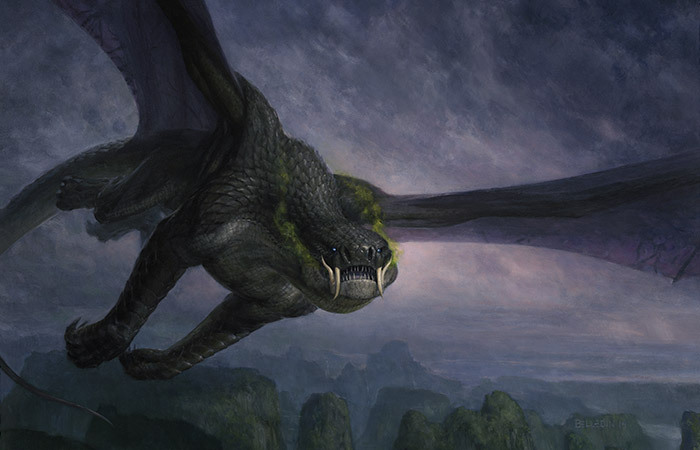 Across the river stood the first dragon Tasigur had ever seen, larger than he could ever have imagined—the progenitor of the entire Silumgar brood. Awe and terror churned in his gut, making his head swim. "Great dragonlord Silumgar!" he shouted. His voice seemed small and weak in the forest, barely audible over the rushing water. He wasn't sure the dragon could hear him at all. "I bring you an offering!" he said anyway, and he beckoned behind him. Six of his soldiers came forward, carrying the throne he had forsaken. The jade seat was laden with gold and jewels—a fortune beyond what any mere soldier could comprehend. Tasigur dearly hoped it was enough. The dragon sniffed at the air and stretched his neck out over the water. Then he coiled back, stretching his wings wide as his legs curled beneath him, and sprang. Tasigur felt death descending on him, blotting out the light of the sun. He fell to his knees and planted his hands in the mud. Death, the death of all things, the end of the Sultai and the end of the world, were all embodied in this magnificent scaled god. Not daring to lift his head, he watched his hands as the earth slowly swallowed them up.